Archakar Grade II / Priest Grade II (அர்ச்சகர் நிலை-II) - 1 Post - Scale of Pay Range 3300-9000 Grade Pay 1250 plus allowances - 8th Std Pass with Three years Course completed in Hindu Ritual Education from Hindu Vedha Ashram / Govt recognised course ; Also able to sing Devaaram (தேவாரம்) with raaga. Suyambagi (சுயம்பாகி) / Cook - 1 Post - Scale of Pay Range 3300-9000 Grade Pay 1250 plus allowances - 8th Std Pass ; Minimum 5 years experience in preparation of Neivathiya Prasadam (Religious Food) as per the Hindu Religious norms. Othuvaar (ஓதுவார்) - 1 Post - Scale of Pay Range 3300-9000 Grade Pay 1250 plus allowances - 8th Std Pass with training / certificate completed in Hindu Ritual Education from Hindu Vedha Ashram / Govt recognised course ; Also able to sing Devaaram (தேவாரம்) with raaga. Day Watchman (பகல் காவலர்) - 1 Post - Scale of Pay Range 2800-8400 Grade Pay 1200 plus allowances - 8th Std Pass with good physique to do the watchman work. Night Watchman (இரவுக் காவலர்) - 1 Post - Scale of Pay Range 2800-8400 Grade Pay 1200 plus allowances - 8th Std Pass with good physique to do the watchman work. Sweeper (துப்புரவாளர்) - 1 Post - Scale of Pay Range 2500-7800 Grade Pay 1100 plus allowances - 8th Std Pass with good physique to do the watchman work. 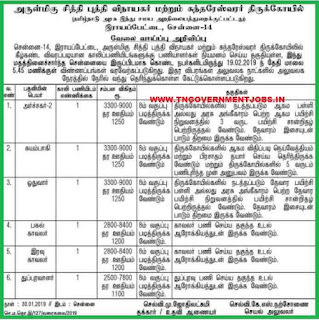 Candidates must be reside in Chennai city. Further more details please visit the following address.